Every human being has a certain power of discrimination between the exquisite and the ignominious, and his soul is enraptured by what isexquisite and detests and feels nauseated at the sight of any ugly thing. This discrimination between observable things has its counterpart in audible, olfactory and perceptible things, as honesty, truthfulness, honour, and valour. Thereupon, all industries were established, civilizations developed, and discoveries occurred aiming at the comfort and the bliss of the human being’s life. Tastes differ, nevertheless, things include ugliness and beauty; ugly things may be beautified by their effect as the bitter medicine that remedies diseases, and beautiful things may become ugly by theirugly effect. All these things are known by the human mind that differentiates between the useful and the harmful, the good and the evil. Consequently, every human being weighs his deeds by the balance of his mentality; heestimates with his volition and assesses the consequences, then he perfectshis deeds with his own self-power, and the abilities he has. Nevertheless, consequences may not coincide with expectations so he reviews the causes of his failure; if the reason of his failure ishis fault and negligence, then he tries once more and feels benefited byknowing the shortcomings of the previous attempt. But if he feels thatthe cause of his failure is beyond his power, then he realizes that thereexists in the universe an overwhelming subduing power far above his own,unimaginable by his own powers, so he submits to the power of fate anddestiny, and knows that he gains happiness in this world and in the hereafterby his will, choice, and the abilities granted to him, and realizes thatAllah’s Power is the source of all powers and abilities of the creatures.He also knows that Allah’s Will is above the will of any createdbeing and one of the impacts of the Divine Will is that it can hinder thehuman being from fulfilling and executing his aim. No help can ever succourhim in attaining his aim save the help of Allah, Who has the absolutePower in fulfilling the sought aim and preparing all the means that assistor obstruct the creature’s way. 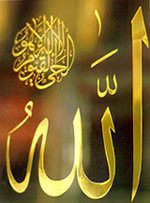 The human being knows that he must utilize all the perceptionsand powers that Allah endowed him with, to fulfill his freelychosen deeds, whether mental or corporal, in what they were created for;he has to benefit from his shortcomings and defaults to attain the bestpossible consequences and the utmost of Allah’s granted Favoursand Endowments. Moreover the human being perceives that the keys of heavenand earth belong to Allah, Praise and Glory be to Him Who enlargesor withholds the means of subsistence. Knowing all these things, the human being recommends his soul to Allah because it is evident that ignoring the available means isdenotative of ignorance; on the other hand, neglecting total and absolutereliance on Allah is nothing but depravation. Allah is theCreator of everything, the created beings and their deeds; He predeterminedtheir lives and deaths, their subsistence and powers; for instance, Allahcreated the spider and its web, the bees and their honey, ants and their perseverance, the moon and its orbit, and the human being and his deeds; all organisms and everything in heavens or on earth are created by Allah, the Originator, the Great Innovator. The human being is preferred over the rest of the created beings by being entrusted with certain assignments and charges, and that he freely chooses his deeds according to his intellect. Allah endowed the human being with three powers, which were not endowed to any other creature, namely, memory, imagination and intellect. The memory retrieves to him the past, imagination embodies the imagined thing and illustrates to him the painor gratification that can be associated with it in the future, then intellecthelps him find the appropriate means to achieve the imagined thing or toavoid it. Before the time of the heavenly Messages, these three mental powers gave the human being the power to differentiate between the useful and the harmful, the good and the evil, so that when messengers were sent to clarify the allowed and the forbidden, human beings were qualified to be charged with duties and regulations because of the mental faculties endowed only to them and to no other being. Everything had been ordained and registered by Allah before creation; a registration due to knowledge and not due to obligation as some people may think. So if the Divine Pen had registered everything that would take place till Doomsday, then everything that takes place must coincide with what had been registered before creation. Nothing in the eternal Omniscience negates man’s free volition, as to the fact thatwhat had been ordained and registered would inevitably occur, is because it is the reality, and reality is not liable to change. Allah, Praise and Glory be to Him, knows that a creature will do a certain deed at a certain time and for that deed he shall be rewarded; or that he shall do a certain deed at a certain time and that for that deed he shall be punished. What takes place in reality is nothing but the fulfillment of Allah’s Will; hence, we know that the human being’s deeds are Allah’s predetermination and creation. Yet these deeds are the outcome of the human being’s good or evil conduct and accomplishments; they are not his creation or discovery as he does not know the source of his body’s energy or its relation to the nerves and muscles, and they are not obligatory where there is a difference between an involuntary movement such as the heart beats and voluntary movement such as moving from sideto side. All the deeds accord with Allah’s will, nevertheless, this does not mean that He is pleased with the them. He is not pleased that some human beings are unbelievers, yet He wants it of them or else it would not have happened. It is He who said, “If it had been God’s plan, they would not have taken false gods” (AN‘AM,107), “If it had been thy Lord’s will, they would all havebelieved, all who are on earth” (YUNUS, 99).Although disobedience and evil are committed according to His Will, yetHe did not order them as mentioned in, “Say, Nay, God never commandswhat is shameful. Do ye say of God what ye know not?”(A‘RAF, 28). Allah commands us to believe and tobe obedient where He said, “God commands justice, the doing of good,and liberality to kith and kin, and He forbids all shameful deeds, andinjustice and rebellion” (NAHL, 90). Thereupon there is a difference between the command and the will, as they may be the same and they may differ. Allah’s Will does not conflict with the creature’s free will, that is why Allah said in the Qur’an, “Let any who will keep it in remembrance. But none will keep it in remembrance except as God wills” (MUDDATHIR, 55, 56), “With profit to whoever among you wills to go straight. But ye shall not will except as God wills, the Cherisher of the Worlds” (TAKWEER, 28, 29), He also said, “..whosoever will, let him take a straight path tohis Lord. But ye will not except as God wills; for God is the full of Knowledge and Wisdom” (INSAN, 29, 30). Allah, Praise and Glory be to Him, had created all the created beings and He had been All-Aware of their deeds; He registered everything along with fate and destiny in the Preserved Tablet. The moment the morsel of flesh is developed in the uterus to become a human being, Allah orders the angel to record four things already registered in the Preserved Tablet, these four things are: the place and time of his death, his livelihood, the details of his life, and whether he will be happy or unhappy. All the powers and abilities of the human being are the creation of Allah Who made these powers for his service and enabled him to use them. Everything that takes place in His Kingdom accords with HisWill, every occurrence prostrates to the mighty Supremacy of Allah,the Lord of Sovereignty, the Possessor of the Kingdom Who overwhelms Hiscreatures with His subduing Power. Allah permits the occurrence of the evil so that the unbelievers and the sinners would have no plea against Him; if Allah had admitted the unbelievers to hell the moment they were created, knowing since eternity what they would do, they would have said the same words mentioned inthe verse, “And if We had inflicted on them a penalty before this,they would have said, Our Lord! If only Thou hadst sent us an apostle,we should certainly have followed Thy Signs before we were humbled andput to shame” (TA-HA, 134). Allah ordered His creatures to be obedient, He sent Messengers who were supported with miracles and He sent the holy books with exact and precise verses, “..that mankind after the coming of the apostles, should have no plea against God” (NISAA’, 165). “..nor would We visit with Our wrath until We had sent an apostle to give warning” (ISRAA’, 15), “Nor was thy Lord the One to destroy a population until He had sent to its Centre an apostle, rehearsing to them Our Signs, nor are We going to destroy a populationexcept when its members practise iniquity” (QASAS,59). Nevertheless, Allah chooses whomsoever pleases Him andblesses them with His Success and Guidance; He, Glory be to Him, said, “Godchooses Messengers from angels and from men” (HAJJ,75), “Thy Lord does create and choose as He pleases”(QASAS, 68), “..God chooses to Himself thosewhom He pleases, and guides to Himself those who turn to Him” (SHURA, 13). As people’s deeds are closely related to the whole existence and to the universe that Allah created, the human being is grantedthe free will to choose and select, but he has no power to make thingshappen. Thereupon, people are called to account for their intentions,that is why Prophet Muhammad, Allah’s Prayers and Peacebe upon him, said, “The deeds are according to one’s intentions,and to everyone is what he intends”.Allah says, “..should he die as a refugee from home for God and His Apostle, his reward becomes due and sure with God” (NISAA’, 100), “Your Lord knoweth best what is in your hearts, if ye do deeds of righteousness, verily He is Most Forgiving to those who turn to Him again and again in truepatience” (ISRAA’, 25). The human being’s deeds are excelled by his intentions, but heshould not suffice with the intentions without working and making an effort, because any noble intention that is not accompanied by righteous deeds is nothing but a delusion. The true intention is that which settles in a person’s heart and denotes what he really wishes to do, and to take all the means to execute it and emit it to existence. This is why they said , “Faith is not mere expression of hopes, but faith is what has settled in the heart and is asserted by deed; there had been people who departed this world and had not done a single righteous deed and said, ‘We had a hopeful opinion of Allah!’, and they lied, for if they had a hopeful opinion, they would have done righteous deeds”(HADITH). Whenever Allah finds people’s good intentions, He guides them to the righteous deeds and facilitates for them all the means to achieve them; the more the person recommends his soul to Allah, the more Allah helps and defends him.